You may be differentiating by reading level, interest, and learning style, but are you differentiating based on student development? But how to integrate DAP into a 21st century classroom? 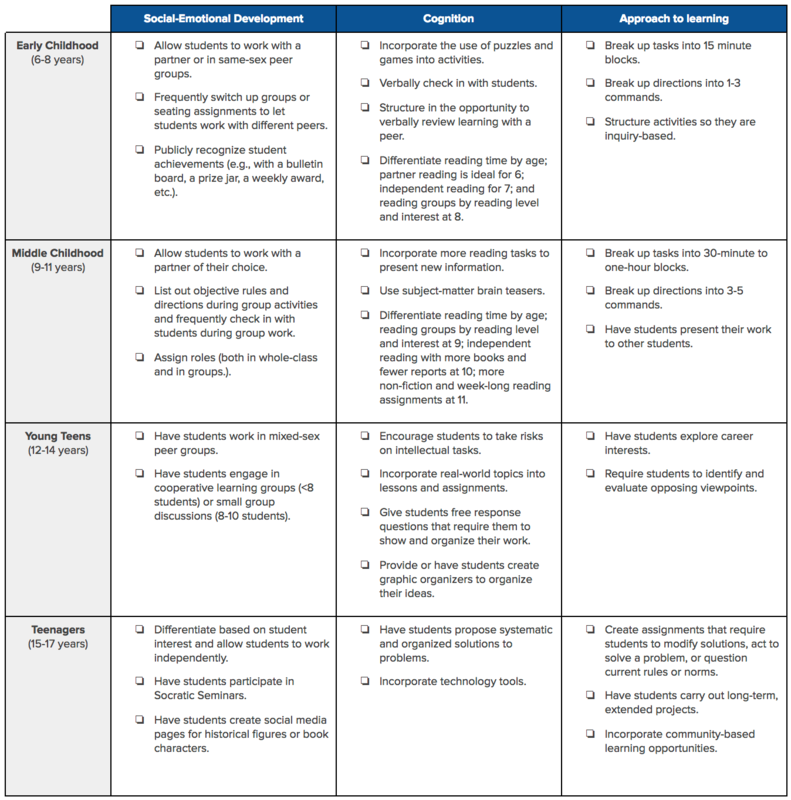 Using research from the Center for Disease Control (CDC), the folks at Albert developed a checklist to monitor student development along with a chart full of developmentally appropriate lesson hacks. The following checklist was designed to help you identify student growth in terms of cognition, approach to learning, and social-emotional development. Gauge individual development at the beginning of the year by observing each learner and translating the checklist below into student-friendly statements to track and support student growth. Once you characterize each learner, you can begin to tweak your lessons and adapt assignments accordingly. Our chart below provides modifications by growth stage; these can be used to make adjustments based on student development. 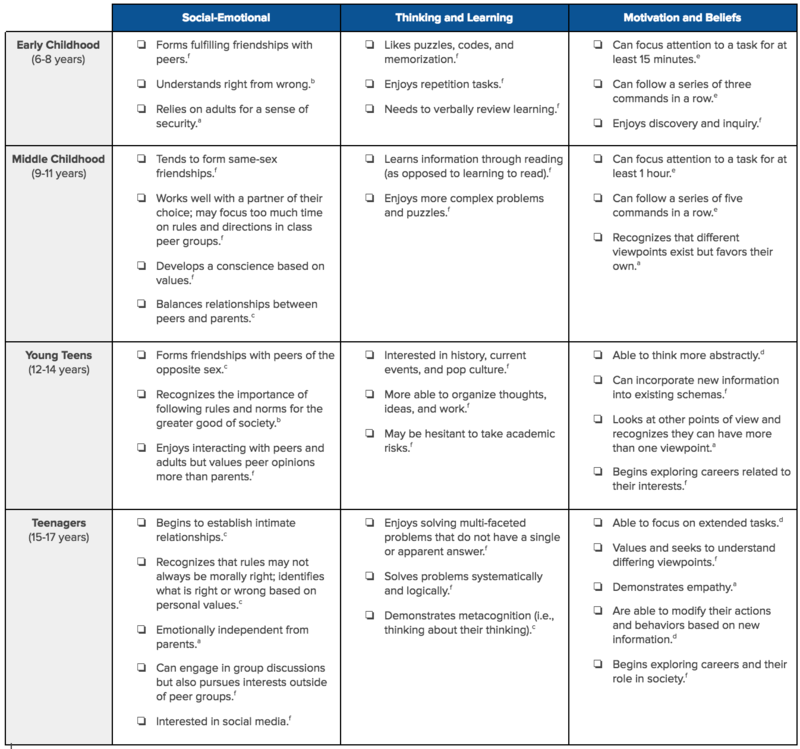 You identified which developmental milestones your students demonstrate and glanced over the developmentally aligned modifications table — now what? Based on where your students are, you can begin to adapt your lessons and assignments, both formally and informally. If you notice a group of eighth-grade students demonstrate middle childhood (9-11 years) social-emotional characteristics or struggle to complete work in groups, you may want to assign each student a role (e.g., scribe, timekeeper, etc.). You may also want to differentiate assignments based on class period, depending on where each class falls. Let’s say you have three sections. If students in your first section demonstrate teenage social-emotional development, have them lead a Socratic seminar. Alternatively, if students in your second hour display characteristics of young-teen social-emotional development, have them participate in 8-10-student discussions. There are many other creative approaches to support your students in developmentally appropriate ways. Use these as guidelines, but tweak and modify based on what your students need. Ultimately, it is at the discretion of the teacher to adapt lessons and assignments to each learner’s unique needs.